“Out here” started out in Federal Heights and Thornton, where Justin went to high school. He moved to Loveland in 2008 and fell into trouble with the law. “I did two years at LCDC (Larimer County Detention Center).” He’s been living on the street “more or less” ever since. Justin worked various construction jobs, and liked working in landscaping the best. But he suffered a whiplash injury, and isn’t able to perform physical labor duties anymore. 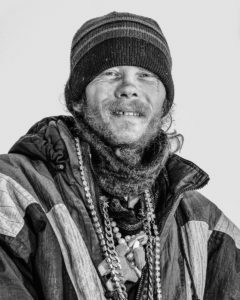 Living on the streets has unique opportunities, which can develop uncommon skills. Justin is a “found artist”, in that he creates things with items he finds. Most of the raw material he discovers by dumpster diving. He fashions what he can into necklaces, bracelets and rings. He has homemade bling, and is eager to tell the story behind each piece. He doesn’t make an impression as someone who would take something that wasn’t his. Instead of tipping into a bottle, Jason tilts over dumpsters. Finding treasure in another one’s trash. A diamond in the rough.